The polls have closed. America has spoken. And the community here at Benedictine College has prayed for America. Monday morning, Eucharistic Adoration began at 3 a.m. at St. Benedict’s Abbey to start the 40 Hour Vigil. Then, the message of Fatima was heard Monday evening when the Pilgrim Virgin Statue of Fatima visited campus. The Pilgrim Virgin then joined the 40 Hour Vigil of Eucharistic Adoration at St. Benedict’s Abbey, which lasted all night Monday and Tuesday until the polls closed. 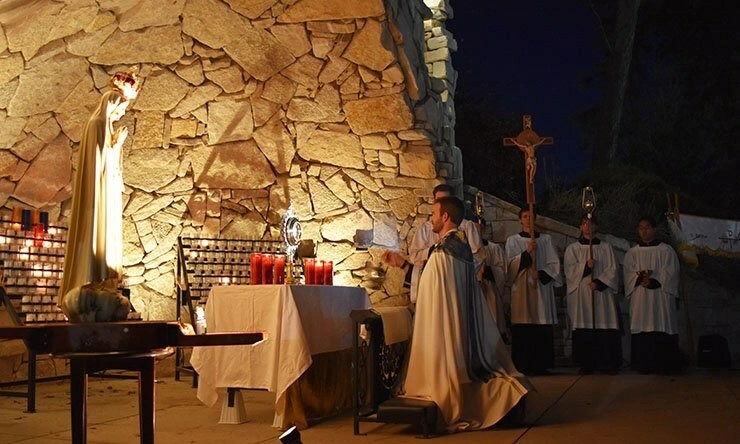 At 6 p.m., the statue and the Blessed Sacrament were processed to Mary’s Grotto, and the daily Fatima Rosary was led during adoration, ushering in the final hour the 40 Hour Vigil and closing the polls. Patrick Sabat of the World Apostolate of Fatima, who travels with the Pilgrim Virgin statue, spoke on the Fatima message of prayer Monday evening. He said that this is a time where Our Lord is calling us to enter into His work of mercy and Our Lady is repeating this. “She is not calling us to do anything extra that we are not already called to do by our baptism,” Sabat said. Her son ”calls us to reciprocate, to give ourselves in gratitude of His salvation to us. It is not anything easily done, in fact we would have to say it is something heroic. Supernatural grace overcomes our human tendencies to avoid suffering at every turn.” That supernatural grace from our baptism is what Our Lady is asking us to look to as we strive to serve others and pray unceasingly for the world. This message of “Pray, pray … then pray some more” is what the Benedictine Community has embraced during this 40 Hour Vigil. Our praying for this country and the world does not end here. It will continue with each daily rosary that we pray for the Fatima Centennial.